“We're here to help you! Not 100% in love with your product purchased from MelissaAndDoug.com? 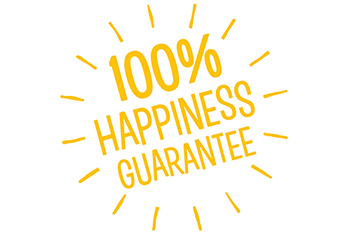 Your happiness is our mission! After receiving your product, you have 90 days to return it, as long as it’s in new and unused condition and in its original packaging. You'll also need a Return Merchandise Authorization number (more on that below). Please note that we currently do not offer gift exchanges. When you receive your order, our contact information will be displayed on the packing slip. Please keep your packing slip in case you need to arrange for returns or exchanges, and read the instructions thoroughly for faster processing of returns. Also, please keep any emails you receive regarding your order, as they may contain important information. Once we receive your return, we will process a refund within 14 business days to the original form of payment. Your bank may require additional time to post this transaction to your account. For help processing a return, please give our friendly team a call during business hours at 1-800-718-5365. By the way, we’re constantly reinventing and reimagining our toys. If you have feedback you would like to share with us, please give us a call! We genuinely listen to your suggestions when reviewing our existing toys as well as new ones in development. When will I receive a refund? Just as fast as we can get it to you! Any credits on your account with us will be refunded promptly as soon as we have received and processed the return. Once we receive your return, we will process a refund within 14 business days to the original form of payment. Your bank may require additional time to post this transaction to your account. We’ll use the same method to refund the amount as you used when you placed the order. For example, if the order was paid by credit card, we will credit your credit card account. May I return a personalized item? If the item you wish to return is inoperable, but has no apparent damage, it is considered defective. Please call us at 1-800-718-5365 or email us at care@MelissaAndDoug.com to arrange for the repair or replacement. How do I return a damaged product? Crash! Boom! Bam! Accidents happen, unfortunately. Damaged merchandise includes items that have been damaged in shipping. If a shipment arrives at your door with apparent shipping damage, please refuse the delivery. If you have already accepted delivery and then find shipping damage, please contact us immediately. It’s helpful to save all packaging material and paperwork. What are your Holiday cut-off times? Ahh . . . it’s the age-old (OK, maybe not that old) question for online shoppers everywhere! We offer free shipping on orders over $49, excluding orders to Alaska, Hawaii, and other non-contiguous U.S. locations. Promotion code must be added in your cart at checkout to apply. In addition, free shipping is applied to the order subtotal after discounts (and before oversized item fees, shipping fees and taxes). Also, certain very large or very heavy items are subject to an Oversized Item fee of $10.50 (or $16.00 for a handful of SUPER oversized items). Where do you ship in the U.S.? Domestically, we ship to the 50 U.S. States, the District of Columbia, and Puerto Rico. We strive to get your purchase to you as quickly as possible. Most orders shipping within the continental U.S. arrive within 3 to 7 business days of successful payment processing. Please allow more time for personalized items and for orders shipping to Alaska, Hawaii, Puerto Rico, P.O. boxes, and APO/FPO addresses. We do not ship to freight forwarder addresses. The cost for shipping is determined by the value of your shipment, whether you are shipping outside the continental U.S. and whether your shipment includes any oversized items. Please see your shopping cart for the shipping charges for your order. • Click on the flag icon in the top right corner of our site. • Select the country you want to ship to and the currency in which you want to see prices. • Go shopping and have fun! At checkout, you'll be able to select an international shipping option. You will be quoted a specific delivery promise at the time of checkout that is based on your selected destination country and the shipping methods available for the items in your shopping cart. Please see our International Shipping FAQ for more details about this feature. Can I ship to a P.O. Box or an APO/FPO address? Yes. Please enter either an APO or FPO in the “City” field. All APO/ FPO orders will be shipped at our Value Shipping speed. Unfortunately, we can’t offer Expedited Shipping to APO/FPO addresses. Please note that delivery dates for APO/FPO and P.O. Boxes are not guaranteed. • The day ranges listed in the table below are estimates for reference. Please check your cart for actual cost and timing for your specific shipment. • During checkout, you'll be given an estimated arrival date for applicable shipping service levels. • Some items are too large to ship Expedited or Rush. • Certain items requiring an Oversize Item fee cannot ship Value as the post office will not accept them. • Please add one additional business day for orders that include Personalized items. • Certain factors may affect delivery dates, such as time of day when and order was placed and whether a holiday falls in the delivery range. Always check your cart, email confirmation, or Order History under My Account for delivery details about your shipment. We’ll send you a shipping confirmation email when your order ships. This email contains your package tracking number and the parcel carrier handling your shipment. You’ll be able to track your package by clicking on a button in that email. You can also check the status of your order anytime by first signing in to our site then going to the Account Details section. Go to Order History, then Order Details to find information on the shipping method and the tracking number. Should you have any additional questions about your order please email us at care@MelissaAndDoug.com or give us a call at 1-800-718-5365. If your order includes several items, they may ship separately and at different times. In order to deliver your purchases to you as quickly and efficiently as possible, items that ship from the same location are grouped together. This could result in part of your order arriving at a different time, but still within the expected delivery window. We process and ship packages Monday through Friday by 1 p.m. (ET). At this time, we do not ship on Saturday, Sunday, or holidays. Please note that most items (except those that require personalization) ship within one business day of successful payment processing. What is the Oversized Item fee? Certain very large or very heavy items are subject to an Oversized Item fee of $10.50 (or $16.00 for a handful of SUPER oversized items). Easy! There are several ways to get to the Sign In menu. On desktop computers, look for “Sign In” at the top right of the screen. On mobile devices, look for the stack of three horizontal lines on the top left of the screen and tap on that menu (fun fact: this is often referred to as the “hamburger button,” due to its slight resemblance to a burger on a bun). Also, if you have products in your cart and head to checkout, you'll be prompted to Sign In. No matter how you get to the Sign In page, once there look for the “New Friends” heading and fill in the fields below. Sign up is fast, easy, and will give you access to all the playful perks of our brand new site, like emails tailored to your interests, special offers, and more. Why don’t my MelissaAndDoug.com login credentials work on the new site? If you had an account set up on MelissaAndDoug.com prior to September 22, 2016 (when we launched this new version of our site), you’ll need to create a new account. Sign up is fast, easy, and will give you access to all the playful perks of our brand new site. Go to the Sign In menu at the top of the site and fill in the fields under the “New Friends” heading. Why should I partner with Melissa & Doug? • Product Variety. Our toys, crafts, and games that span the ages from babies to big kids. • Audience Diversity. Our diverse and enthusiastic customer base includes millions of parents, grandparents, educators, caregivers, and gift-givers. • Toy Quality & Safety. We stand behind our products 100% and are committed to making toys you can trust. Complete the Rakuten LinkShare application for the Melissa & Doug program. Once approved, post a MelissaAndDoug.com link on your site. Send customers to Melissa & Doug through your links and you will be paid for sales via Rakuten LinkShare! Are you in compliance with the Consumer Product Safety Improvement Act (CPSIA)? In August 2008, the Consumer Product Safety Improvement Act (CPSIA) made a number of changes to consumer product safety laws in the USA. Under this law, the amount of total lead allowed in children’s products was gradually reduced. Effective August 14, 2011 no children’s product may contain more than 100 parts per million (ppm) total lead. The lead content of any surface coating is limited to 90 ppm. We are pleased to tell you that YES, Melissa & Doug products are compliant with the CPSIA regulations. Since our founding, we have had a comprehensive testing program in place for all of the products we produce and sell. Our testing programs have always been in compliance with all US consumer product safety regulations, and we will continue to stay compliant even as some of these laws evolve and change. As a result, you can continue buying our products with confidence knowing they comply with the lead standards under the CPSIA. Of course, we also have General Conformity Certificates readily available for products produced after November 2008 as required by the CPSIA as further assurance of our products’ compliance to CPSIA. Do you have General Conformity Certificates for your products? Do you have an EC Declaration of Conformity? Looking for answers fast? Search our Help Center or give our Customer Care Team a shout during our business hours – anyone would be happy to help you. Everyone loves a great free shipping deal! Just fill your cart with at least $49 of fun (so easy! ), make sure you’re not shipping your order to Alaska, Hawaii, or other non-contiguous U.S locations, and bask in the satisfaction of scoring free shipping! Please note, free shipping is applied to the order subtotal after discounts (and before oversized item fees, shipping fees and taxes). Please note that certain very large or very heavy items are subject to an Oversized Item fee of $10.50 (or $16.00 for a handful of SUPER oversized items). Our friendly play experts are ready to help. Where do you ship and how long will delivery take? Here’s a list of the more than 200 countries we ship to. Please note that not all products are available in every country. You will be quoted a specific delivery promise at the time of checkout that is based on your selected destination country and the shipping methods available for the items in your shopping cart. What products are eligible for international shipping? Many of our products are available for international shipping, but some countries put restrictions on certain items. Our website will prevent you from putting those items in your international shopping cart. If you start shopping on the U.S. site and then switch to our international site, items in your cart may not be eligible for international shipping and you will be notified of this at checkout. E-gift cards cannot be purchased and sent outside of the U.S.
What payment options are available for international shipping? Borderfree supports Visa and MasterCard for all international orders. Other payment options are available for certain countries and will be communicated to you within the checkout process. How are the exchange rate, duties, and taxes calculated? Please note that once you place an order for a personalized item, it may not be canceled. Where can I find assembly instructions for my product? Besides this website, where can I buy Melissa & Doug products? So many places! Melissa & Doug toys, crafts, and games are sold all over the country at independent toy stores, large chains, craft emporiums, gift shops, hardware stores, and more. Our products can also be found at retailers in other parts of the world. To find a retailer near you, call us at 1-800-718-5365. Can I purchase custom products for an event or corporate gift? We offer a range of products available for custom printing of company logos or artwork. Please email the sales team at sales@MelissaAndDoug.com for more information or to place an order. Where can I find more detailed information about specific products? Where can I register my product? There are only a few Melissa & Doug products that require registration. Go to our Product Registration page to see if registration is required for your item. At checkout, simply type the promotional code in the “Apply promo codes” field and select “Apply.” To apply more than one promotional code, enter the first code, then select “Apply.” Enter your next promotional code and select “Apply” again. Please note that certain promotional codes may not be combined. For free shipping promotions, please also note that free shipping is applied to the order subtotal after discounts (and before oversized item fees, shipping fees and taxes). Sign up for email to receive offers, news, and tips! • All promotions are valid at MelissaAndDoug.com only. • All promotions are subject to certain terms and conditions, which differ from promotion to promotion. • We reserve the right to limit quantities purchased on promotion. • Promotions are for a limited period, and the dates covered by the promotion are listed in the fine print. • Various promotions have minimum purchase requirements. These requirements are set forth as part of the online promotion description. When calculating the minimum purchase amount, we do not include charges for shipping, handling, or the applicable tax. The minimum purchase amount is net of discounts and does not include gifts with purchase or free items. • Unless otherwise stated as part of the promotion description, all promotions require a purchase. • Free Shipping offers are available only to non-P.O. Box addresses in the continental United States. These promotions are not available for purchases that will be delivered to Alaska, Hawaii, Puerto Rico, or other non-contiguous U.S. locations. Free shipping promotions refer to standard shipping unless otherwise noted. • All promotions are void where prohibited by law. • Promotion codes, e-gift cards, and account credits are not redeemable for cash or credit. • Gifts with purchase and/or free items are not eligible for returns or refunds. • Previous purchases are not eligible for adjustments based on current promotions. • Only one (1) discount promotional code (or coupon) may be redeemed per order at MelissaAndDoug.com. Some promotions like free shipping or gift with purchase may be combined. See terms and conditions for specific promotions. • Coupons and promo codes are only valid for use only at MelissaAndDoug.com. • Any use of a coupon for products other than those indicated constitutes fraud. • You are responsible for any applicable sales tax. • Refunds for items purchased from MelissaAndDoug.com using a coupon will be at the price actually paid for the item, net of these discounts. • Account credits, promotion codes, and e-gift cards have no cash value. • Coupons for MelissaAndDoug.com that are on websites or blogs not owned by Melissa & Doug, LLC, are not valid. • Gifts with purchase may not be returned for refund. Do you offer price matching? As a manufacturer, we do not typically offer to match the prices of other retailers. However, we do regularly offer deals and promotions on our products. Please be sure to sign in to our site, check your account preferences, and check to see that you're signed up to receive our emails. Feel free to give us a call at 1-800-718-5365 if you have any other questions. Missing pieces are no fun! Here’s what you can do. How do I find a replacement part? We wish we could magically replace all lost pieces and parts to our toys, but unfortunately, we’re not able to stock each and every piece. Because of the way many of our products are made some of the parts and pieces are not interchangeable from one product to another. If you’re missing a piece, or received a damaged item, please give us a call at 1-800-718-5365 or email us at care@MelissaAndDoug.com and we’ll do our very best to help you figure out your options. We’ll need some product info so please have either the product in front of you or a photo of the product label you can refer to, if that’s more convenient. We believe in treating our retailers like family. If you’re interested in carrying Melissa & Doug products in your store, we’d love to chat! How do I become a Melissa & Doug retailer? By carrying Melissa & Doug products, you’re signaling to your customers a commitment to quality, safety, and open-ended creative play. Our team can help you choose just the right selection for your shelves. Let’s talk! Please give us a call at 1-800-284-3948 or apply now. Yes! Absolutely! From day one, we (Melissa and Doug) have signed our names to every product we make. We take that signature seriously, and it’s why we wanted to answer questions on this topic personally! Our signature is our commitment that you can trust Melissa & Doug products. All of our products comply with all U.S., E.U., and other international safety regulations. We go above and beyond when it comes to testing and safety. How do you test your toys? As parents, every time we make a product for you, it also has to pass the test of coming home with us, where we enjoy playing with these same toys with our children. Our colleagues also regularly test our products with their families before they are made available for sale. We also test at different production phases. We always start with a carefully designed product. We have strict manufacturing instructions for our factories. In addition, there’s no substitute for testing, testing, and more testing. Our Melissa & Doug employees are stationed at the factories and go the extra step of auditing, inspecting, and testing at various phases of the production process. Lastly, we take the extra step of having independent agencies test our products. We specifically test our paints and coatings frequently to be sure our toys meet or exceed government recommendations limiting heavy metals, lead, and phthalates in children’s items. All of our results have been verified by 3rd-party, independently accredited testing laboratories, considered by many to be the best scientific laboratories in the world. Where can I find more information about your product testing? Please continue to enjoy our toys with confidence, knowing that each and every time we design and craft a toy, we’re not only making them for you, but for our own kids, too. Where can I find Melissa & Doug on social media? And don’t forget our blog! It’s filled with activity ideas, craft projects, and advice for making time for free play in your child’s busy life. How do I share photos of my kids playing with your toys? We love seeing all the countless ways to play with our toys.To share images of your kids at play, go here. What orders are subject to sales tax? We are required to collect sales tax in these states: California, Connecticut, Georgia, Michigan, New Jersey, and New York. What if I’m ordering for an organization that is tax exempt? Our ecommerce site was designed for supporting consumers and does not support tax exempt orders from organizations. If your organization places an order for delivery in a state which we have nexus, we recommend you retain the receipt and request a refund for sale tax paid when filing your sales tax returns.